Scot Fin profile. Who is Scot Fin? More than his book. 2017 April photos for week of the 24th to the 28th by Author Scot Fin. Full size slideshow at the bottom of this post. Read Scot Fin novel, Kobo, Kindle or Google Play. Merry Christmas … no … wait … it’s end of April. 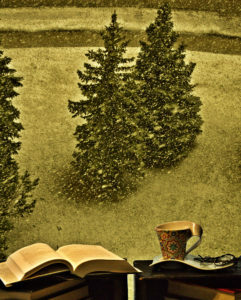 While many of you enjoyed a nice warm spring weekend, I decided to have a cup of coffee and read during a nice spring snow storm . 2017 April images for week of the 17th to the 21st by Author Scot Fin. And I thought, for my writing, it was ‘somebody’ talking to me who strangely wills and works for ‘himself.’ I think, however, there is nothing truer for a writer than the “something” that “strangely wills and works for itself” part. 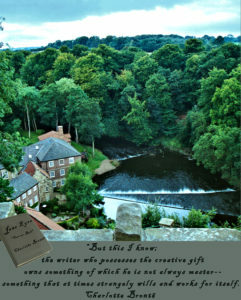 Thanks to Charlotte Brontë for finding me in Yorkshire to straighten me out. I suppose it was appropriate since she was born in Thornton, Yorkshire and I was in Knaresborough, Yorkshire for this picture. That was about as close as I got to her birth place but I still found her book, something called “Jane Eyre.” I believe it is somewhat well known but surprisingly this one was under her pseudonym, Currer Bell, and her name. I understand the pseudonym was, because of the era, used to hide gender. The book in the image, which I just might have created for this photo, has both names to illustrate this interesting, and hopefully, past era fact.